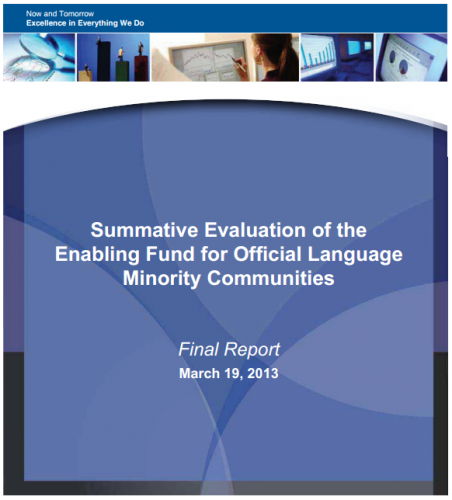 This report presents the findings from the Summative Evaluation of the Enabling Fund for Official Language Minority Communities (henceforth 'the Enabling Fund' or 'the Fund'). The evaluation was conducted by Human Resources and Skills Development Canada (HRSDC) and primarily focused on activities completed during fiscal year 2010-11. The overall objective of the Enabling Fund is to enhance the development and vitality of official language minority communities (OLMC) by strengthening capacity in the areas of human resource and community economic development, and by promoting partnerships at all levels, including with federal departments. The Fund plays the role of facilitator by helping OLMCs create and strengthen partnerships, and gain access to additional sources of funding. The Fund is intended to complement existing programs that directly support OLMCs. The Enabling Fund has an annual budget of $13.8 million, of which an average of $12 million funds contribution agreements and $1.8 million is used for program policy and management as well as research, analysis, monitoring, evaluation and secretariat services for two National Committees. Funding is provided to 14 Contribution Agreement Signatories (13 provincial/territorial and 1 national organization) who receive support to carry out activities that will ultimately benefit OLMCs. In the 2010-11 fiscal year, Contribution Agreement Signatories spent $11.5 million and HRSDC spent $1.4 million on operating and management expenses. According to the Census, over two million people in Canada belonged to an official language minority population in 2011. These individuals were approximately evenly divided into minority Anglophones and Francophones, with 1,057,485 Anglophones living in Quebec and 1,007,590 Francophones living outside Quebec. Economic trends among OLMCs and minority-language speakers are complex. For instance, while some OLMCs are on par with majority communities in terms of labour force participation and income level, others are struggling to maintain the vitality of their communities. The flexibility of the Enabling Fund allows Contribution Agreement Signatories to tailor their activities to the needs of the OLMCs in their provinces and territories. The evaluation found that signatories followed a process of researching and planning prior to undertaking their activities in order to meet the needs of the communities they serve. The Contribution Agreement Signatories confirmed that their communities face economic and human resource development challenges. The recent Report of the Standing Committee on Official Languages also confirmed the continued needs of these communities.Footnote 1 While differences exist, there are parallels in the needs of all OLMCs, particularly in terms of the Enabling Fund goals of supporting community vitality and economic development. Community partners and participants found the activities in which they participated to be relevant and useful. Partners found the activities to be useful in terms of: contributing to the promotion of minority language communities; developing mutual aid; community collaboration and partnerships at different levels of government and non-government organizations; helping with enterprise development and cooperation; contributing to job creation and retention of youth in the community; and facilitating networking. Community participants felt that activities they participated in were useful in terms of: contributing to the promotion of minority language communities, the development of their community, their skills development, youth retention, and regional tourism. They also felt that the activities facilitated networking. In addition to being relevant to the official language minority population and communities, the Enabling Fund responds directly to departmental and federal priorities. Specifically, the objectives of the Fund align with legal and mandated responsibilities, as well as with the commitments to support linguistic duality, develop a skilled, flexible labour market, and focus on community-based solutions when relevant. The Enabling Fund is one of the measures undertaken by the federal government under Section 41 of the Official Languages Act 1988. Moreover, the Government of Canada has committed to support both official languages in its policy of linguistic duality as set out in the Roadmap for Linguistic Duality 2008-2013: Acting for the Future (2008) and the Speech from the Throne (2010). More recently, Budget 2012 announced that the Economic Action Plan 2012 would continue to support official languages by maintaining funding to protect, celebrate and enhance Canada's linguistic duality. Human resources development among OLMCs is one of the key expected outcomes of the Enabling Fund and is consistent with the government's and HRSDC's priority to develop a skilled, adaptable and inclusive labour force and an efficient labour market. HRSDC specifically notes OLMCs as a key client community. Furthermore, the Enabling Fund is also aligned with the priority to engage in community-based solutions as outlined in the 2010 and 2011 Speeches from the Throne.